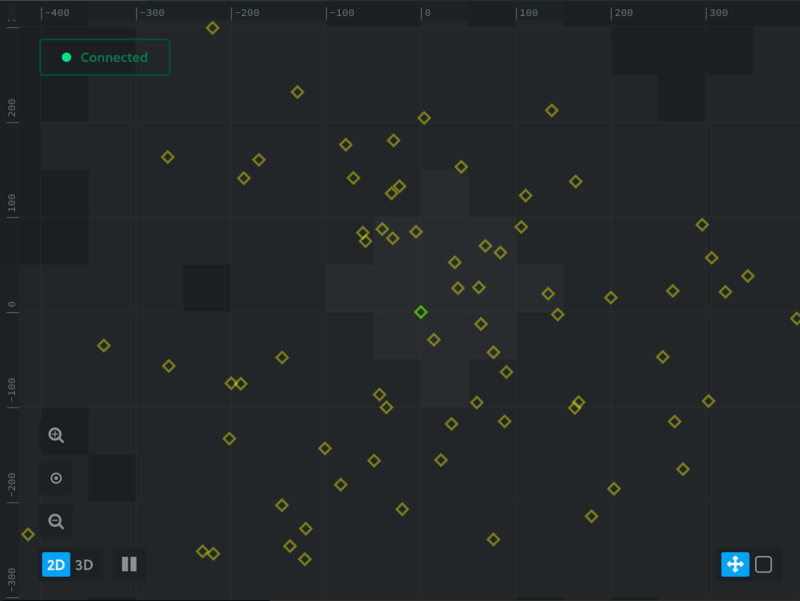 The Inspector provides a realtime view of what is happening in a deployment: which entities are present, where they are, what their components’ propertiesare , which workers are connected to the deployment, what they’re responsible for, and much more. 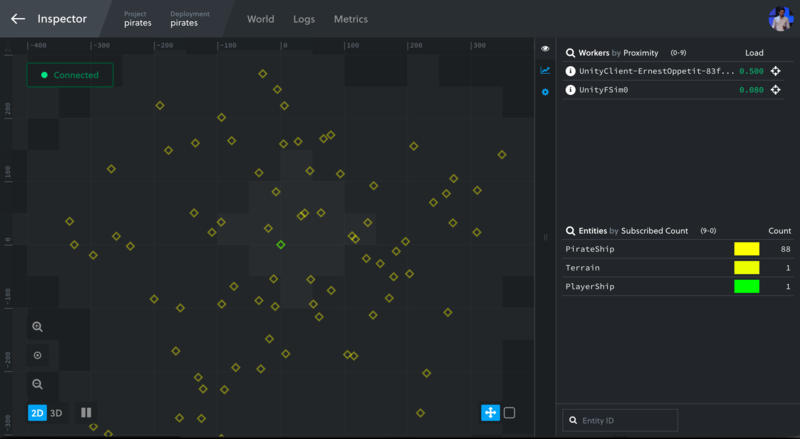 This makes the Inspector a crucial companion to monitoring and debugging SpatialOS deployments - read on for details! You can access the Inspector for local and cloud deployments. For a local deployment, access the Inspector at http://localhost:21000/inspector. The World View is a 2D and 3D representation of all entities’ live positions. If you know the entity ID of the entity you’re interested in, you can also search for it in the sidebar. Note that entities can be colored by entity type in the sidebar of the inspector. Pro tip: you can also import/export your color preferences from the settings tab. Finally, the World View has a Connectivity message on the top left to indicate whether there are any delays in the ‘freshness’ of the deployment data being dispalyed. Check out this page for more details on it! Delete an entity: eradicate it from your deployment! 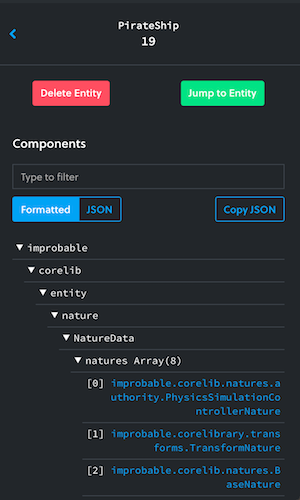 Observe all of the entity’s component properties in realtime. The components are presented either in tree structure or in JSON, and can be filtered. All values are sampled every second or so. Observe which workers have write access to components on this entity. The selected worker’s area of write access is outlined. View the Load, or utilization, that each worker is under. 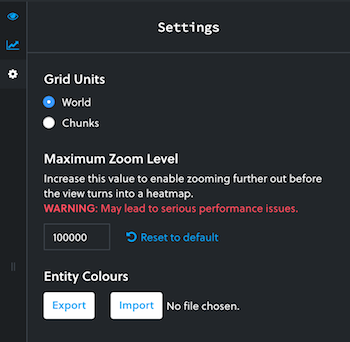 When a worker is under too much load, SpatialOS can automatically bring one back up if your load balancing settings are configured appropriately. Remove the worker from the deployment. 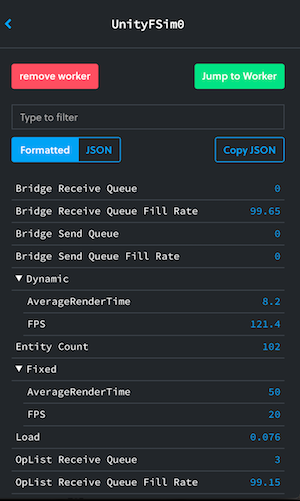 Observe a number of useful worker metrics, such as FPS, Send/Receive Queue sizes, and counts of entities the worker is acting on broken down by Entity type. The yellow line shown is the world boundary. Using the Inspector can impact the performance of the deployment being inspected. For more information on this, visit this page.